The outcome of this poll shows that Romney has a very slight lead over President Obama. Half of the people polled, 50 percent, said that they were likely to vote for Romney, while just 49 percent that they would like to see the president have another term. Very few people, only 2 percent, were undecided as to whom their vote would go. 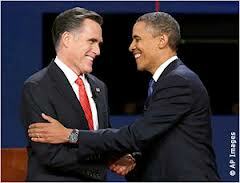 By gender, Romney is the favorite of men 50 percent to 48 percent. Women are equally split on their choice for a president, with 49 percent saying they'd vote for Romney and 49 percent planning to vote for Obama. Based on this public opinion poll, President Obama has a negative approval rating as 44 percent of the people who participated in the polls said that they approved of how he handled his four years in office, however, 50 percent said that they did not approve. When asked whether they felt that the country was headed in the right direction or not, 49 percent responded that America is going in the wrong direction, while 43 percent said that the country is on the right path. By party line, 43 percent of survey respondents were Democrat, 35 percent were Republican and 22 percent were Independent or another party. Of the individuals, 53 percent were female and 47 percent were male. As for their race, the majority, 63 percent, were white, 13 percent African American, 20 percent Hispanic, 1 percent Asian and 3 percent classified themselves as a race not separately listed. Nearly half of the respondents, 48 percent, were Protestant or another Christian religion, with an additional 32 percent professing to be Catholic. People of the Jewish faith made up 6 percent and Muslims comprised of 2 percent. Another 12 percent were of a different religion, or none at all. More than half of the respondents were between the ages of 30 and 64, with 30 percent being in the 30-49 age group and 33 percent being aged 50-64. There were 16 percent in the 18-29 age group and 22 percent who were age 65 and older.